I was struck by the extensive institutional infrastructure of the Christian communities in South Korea and the powerful role church communities play in the lives of so many South Korean parishioners . . . . Through its alumni and current students, the GTU is making a powerful impact on Korean religious life. 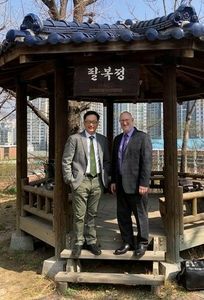 My trip to South Korea with GTU Dean and Vice-President of Academic Affairs Uriah Kim at the end of March was a wonderful introduction for me to this country of contrasts. Our week-long trip included meetings with GTU alumni as well as visits to a number of religious institutions that are at the forefront of Korean religious culture. On our first evening in the country, Dean Kim and I had dinner with 15 GTU alumni. They are professors, pastors, and leaders in various institutions and communities throughout Korea. We enjoyed hearing stories of their GTU experiences and the strong, positive connections they maintain with the GTU. Over the course of our week, we visited three prominent Christian university seminaries where we met with leaders and students and I delivered chapel sermons and classroom lectures. As perhaps the first rabbi to speak to many of these audiences, I was received very warmly as the new GTU president. My sermon, entitled “To be a Stranger and a Resident: A Profound Biblical Dialectic,” and my lecture, “Passover, Pluralism, and Passionate Love,” were both translated into Korean so that all present could follow along. In addition, we went to several church services, including Sunday morning worship at the largest Presbyterian church in the world, where Dean Kim and I were graciously welcomed by the senior pastor. More than 7000 worshippers were in attendance that morning, many of whom also express their devotion by participating in weekday early morning services. We also visited the oldest Reformed church in Korea, where we met with senior pastor and GTU alumnus Rev. Dr. Lee Sang Hak, and were given a tour of the church's brand new, 19-story church building. I was struck by the extensive institutional infrastructure of the Christian communities in South Korea and the powerful role church communities play in the lives of so many South Korean parishioners. At the same time, the Confucian and Neo-Confucian roots of the Korean culture, which lie just beneath the surface, became evident as we visited the hometown of another GTU alumnus, Professor Heup Young Kim, in central Korea. Dr. Kim, who will be a visiting scholar at the GTU this fall, took us to a historically significant Confucian village and center of learning that preserves the memory of the Confucian academies that once flourished in Korea. We climbed the steep steps to a beautiful Buddhist Temple with a magnificent view of the mountainous countryside, met with a Buddhist monk there, and took in the calm transcendence of this centuries-old place of worship and study. Professor Kim presented me with a copy of his recent book, A Theology of Dao, which develops a fascinating weaving together of Neo-Confucian thought and Christian theology. Friday evening and Saturday, I experienced Jewish life in Seoul by attending the Chabad synagogue for Shabbat services and meals. In this lively place of prayer and study, I met Americans, Israelis, and Koreans who form the small but vibrant Jewish community. Unfortunately, my return flight made it impossible to attend the inaugural celebration of the first Mikveh (Jewish ritual bath) in Korea that took place Sunday evening at the Grand Hyatt Hotel. This was my first trip to Korea, but it surely will not be my last one. Through its alumni and current students (Korean students represent the largest group of international students at the GTU), the GTU is making a powerful impact on Korean religious life. The pluralism of the GTU and our diverse, deep scholarly resources are bringing new, innovative religious ideas to a culture that is both conservative and cutting-edge, continually in the process of transformation. 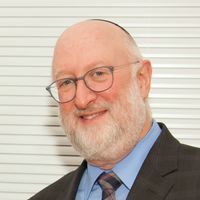 Rabbi Daniel L. Lehmann is the eighth president of the Graduate Theological Union in Berkeley.